FITS CHEST SIZES BETWEEN 27" and 46". 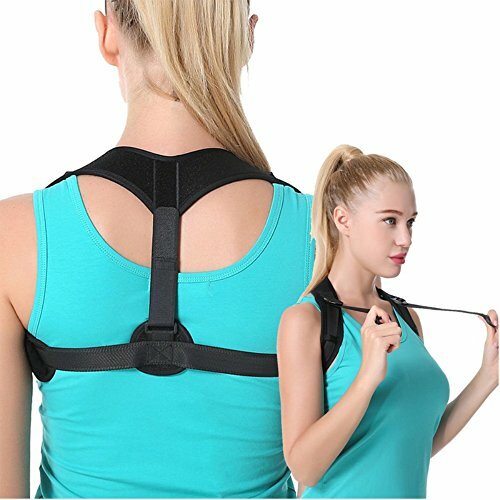 Aihiko posture corrector is suitable for men, women and kids, with adjustable straps from front, easy wearing and perfect fitting. RELEVE BACK AND NECK PAIN: by perfectly aligning your shoulders and upper back, allowing you to achieve optimal posture and reduce backaches after using computer or phone for long time. KEEP BACK STRAIGHT: this upper back brace provides enough support significantly correcting posture problems caused by slumped shoulders, slouching & kyphosis. You'll feel taller, thinner and healthier. LIGHTWEIGHT AND BREATHABLE: made of neoprene and nylon knit fabric, the shoulder brace is flexible and lightweight. You can enjoy your daily life as usual no matter wearing it under or over your clothes. WASH BY HAND: this clavicle support brace is very easy to clean and dry, wash it by hand to prevent deformation. If you have any questions about this product by AIHIKO, contact us by completing and submitting the form below. If you are looking for a specif part number, please include it with your message.